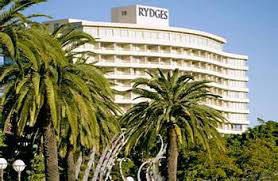 The conference organisers have secured special conference rates at both Rydges Brisbane South Bank, and for the more budget conscious, the Ibis Brisbane. These rates are exclusive only to attendees of NIME 2016. The conference rates only apply if BOOKED THROUGH THE CONFERENCE ORGANISERS AS PART OF THE ONLINE REGISTRATION PROCESS, and are not applicable if you make your booking directly with the accommodation provider. Registration for NIME 2016 will open shortly. Enviably located in the heart of Brisbane’s arts and entertainment precinct and directly next door to the Brisbane Exhibition and Convention Centre, Rydges South Bank Brisbane accommodation has a wide range of attractions on its doorstep including the South Bank Parklands and the Queensland Performing Arts complex. All rooms feature modern amenities including a microwave, minibar, hairdryer, iron, ironing board, high definition LCD TV, workspace and digital safe. Complimentary high-speed WI-FI is also available in all rooms so you can keep in touch with the office via email, or friends and family through social media. Need to relax? Take a dip in the pool, or keep in shape with a visit to our Life Fitness Gymnasium which is also home to our spa and sauna. Room contains two Queen Beds and a private walk out balcony and sleeps up to four adults. However room rates are only applicable for up to 2 Adults; extra adults are charged at $60 per night. Ibis Brisbane is conveniently located in the city center, within easy walking distance of the Queen Street Mall shopping precinct. 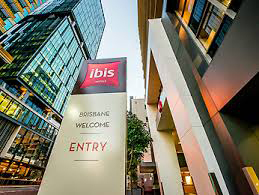 With its superb central location, ibis Brisbane provides the ideal base for exploring the best of Brisbane, from its stylish cafés, bars and restaurants, to its many cultural, sporting and historical attractions. Guests staying at this convenient Brisbane hotel are within walking distance of Suncorp Stadium and Roma Street, as well as a range of public transport options. By walking over Kurilpa Bridge, guests can discover South Bank, Gallery of Modern Art, the Wheel of Brisbane, the Queensland Museum and the Queensland Conservatorium. 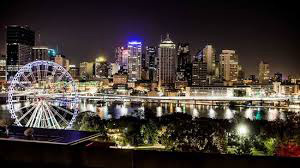 If the above accommodation options are not suitable there are many other accommodation providers in the South Brisbane and Brisbane City areas ranging from one to five star options. A number of these alternatives are listed below and a search on Wotif.com or booking.com will provide many more options. Brisbane is easily accessible via the Brisbane Airport with non-stop services from all capital cities and many regional areas. The Centre’s central city location is convenient for visitors with easy and direct access to an efficient citywide transport network of buses, trains, taxis and the river’s high-speed regular catamaran service. The city to airport Air Train operates from the South Brisbane train station, adjacent to the Convention Centre. Airtrain – Catch the Airtrain from South Brisbane station to Brisbane’s international and domestic airports. Tickets are available for this service from the Client and Visitors Services Centre located in the Main Foyer. Bus Services – South Bank is serviced by two bus stations: The Cultural Centre Station on Melbourne Street and the South Bank Busway Station cnr of Colchester and Tribune Streets, South Bank. Taxi – Taxi ranks are located outside the main entrance to the Convention Centre on Merivale Street, at Mantra South Bank on Grey Street. There is a taxi drop off located at the Convention Centre Grey Street entrance.